Argile is an experimental, C-based, compiled programming language, that produces C code. It is not intended for beginners, but for experienced programmers with a good knowledge of C language. Also, it is not intended for big productions uses, since its compilation time may not scale linearly. The version 1.0.0 of ARC is about 16900 lines of argile code, and compiles itself on an AMD Athlon™ 64 Processor 3000+ in about 1 minute and 44 seconds ! (an average of 162 lines per second) but that is including GCC compilation time which is around 30 seconds. On an Asus EeePC (Intel® Celeron® M 900MHz processor), it compiles itself in about 4 minutes and 51 seconds (average: 58 lines per second). This is probably the slowest to compile known programming language; indeed, compilation time doesn't necessarily grow linearly with the number of definitions. The execution speed however should be the same as with C.
With recent optimizations, the version 2.0.0 of ARC, having 17121 lines of code, compiles itself on the same Asus EeePC in 4 minutes and 12 seconds (average: 68 lines per second). On an Intel® Core™ i3 2350M CPU @ 2.30GHz, it compiles in about 44 seconds (23 seconds with 3 concurrent compilation jobs). 1.3. Why the name "Argile" ? Argile means clay, which is often plastic and can take any shape. Since the main feature of Argile programming language is to be polymorphic, Clay would have been a well-suited name. However, this word is too common, and a Clay programming language already exists (according to web search engines). To compile argile compiler, you will need: GCC, GNU make, GNU bash. To modify and/or recompile the argile compiler, you will also need: automake, autoconf, libtool, GNU bison, flex. (see the AUTHORS file distributed along with this software). Language reference can be found here. How_to_distribute_argile_sources.txt : Describes how to distribute a portable software written in Argile, so that it can be compiled even if the Argile compiler and runtime is missing on the host system. are also added to the file path. for other types, it prints a pointer address (%p format). 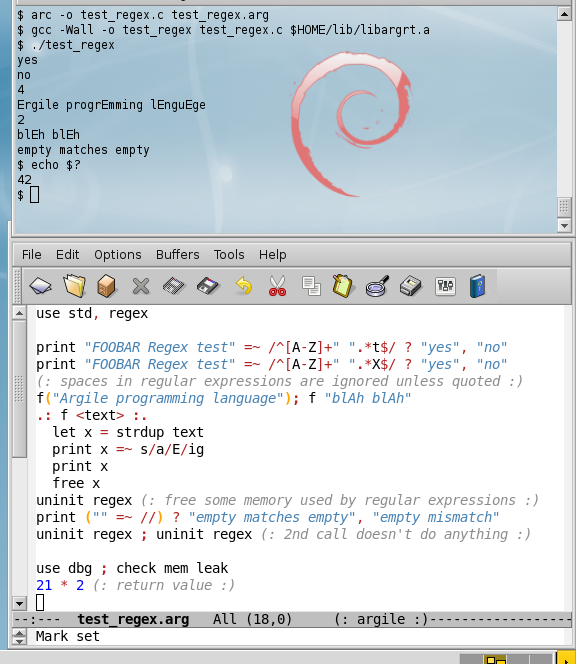 standard error rather than the default standard output. Only the first syntax parameter is considered, but it can be in a list. 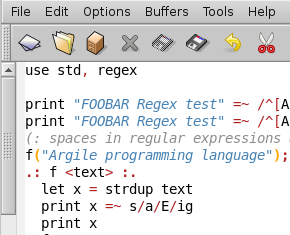 F.t = "some foobar text"
E-mail to < argile-questions at nongnu dot org > (a public mailing list) for any question related to programming in Argile, or compiling or installing the Argile compiler. You can also consult its archives here. Argile compiler is free software: you can redistribute it and/or modify it under the terms of the GNU General Public License, either version 3 or (at your option) any later version. (see COPYING for details). Copyright © 2009,2010,2011,2014 The Argile authors (see details here). Permission is granted to copy, distribute and/or modify this document under the terms of the GNU Free Documentation License, Version 1.3 or any later version published by the Free Software Foundation; with no Invariant Sections, no Front-Cover Texts, and no Back-Cover Texts. A copy of the license is included here.